I'm not keen on Depardieu...or his ghastly wine which may be why I went off him....but he has a point! I've tried signing in on Wordpress...but I get a message announcing that URL contains illegal characters. If you are pasting the link that is the problem. If you try and type it in, that may work. Indeed, me too, and his turn of phrase. 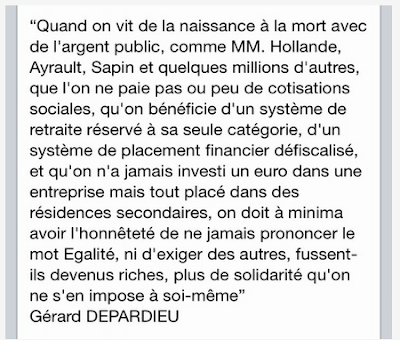 Chapeau to Depardieu for saying what many may be thinking. Doesn't mean I think much of him otherwise (though I've enjoyed some of his films in the past) but he's spot on here. Yes, it's a shame no one else says it who counts, and very loudly too! I liked him better when he was a simple Provencal peasant. Oh, that was a movie! LOL there's nothing simple about our Gérard! Depardieu - you have to hand it to him, he's a good actor - strikes me as a drunken old turd, tho. It's staggering what he can drink in a day apparently. An interesting, albeit long-winded (French) way of reminding the pot he's calling the kettle black. 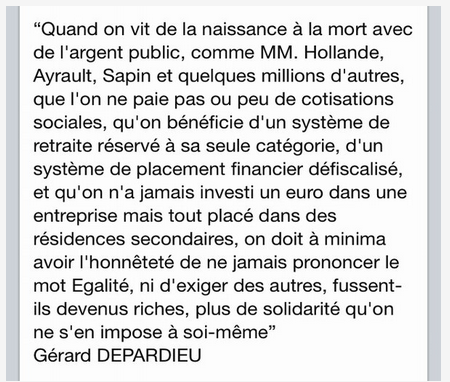 Nice sens de la répartie, Mr Depardieu. Yes, very French and it's the sort of writing that shows the expertise of the writer. I've never been able to master those convoluted phrasings (not that I've tried too hard either...). Woooo, "fussent-ils"!!! I didn't think anyone was that grammatically correct any more. Brill. Yep, you have to admire his skill with language! I hate admitting it because I am not a fan of his, but Gerard does have a point. Of course, you don't have to like someone to recognise the truth in what they say. And no one could dispute his words here!